The bat falcon (Falco rufigularis) is a falcon that is a resident breeder in tropical Mexico, Central and South America and Trinidad. It was long known as Falco albigularis; the name Falco fusco-coerulescens or Falco fuscocaerulescens, long used for the Aplomado Falcon, are now believed to refer to the present species. The female Bat Falcon, at 30.5 cm length, is much larger than the 23 cm long male. Adults have a black back, head and tail. The throat, upper breast and neck sides are creamy white, the lower breast and belly are black, finely barred white, and the thighs and lower belly are orange. Young birds are similar but with a buffy throat. The call of this species is a high pitched ke-ke-ke like American Kestrel. It is probably closely related to and looks like a small version of the Orange-breasted Falcon. These two, in turn, are probably closest to the Aplomado Falcon and constitute a rather old American lineage of Falcos. This small dark bird of prey inhabits open woodlands and forest clearings. Bat Falcons perch conspicuously on high open snags, from which they launch aerial attacks on their prey. They hunt bats, birds and large insects such as dragonflies. The smaller male takes more insects, and the female more birds and bats. The flight is direct and powerful. This falcon is partly crepuscular, as the bats in its diet suggest. It lays 2–3 brown eggs in an unlined tree hole nest. The black-necked stilt (Himantopus mexicanus) is a locally abundant shorebird of American wetlands and coastlines. It is found from the coastal areas of California through much of the interior western United States and along theGulf of Mexico as far east as Florida, then south through Central America and the Caribbean to northwest Brazil southwest Peru, east Ecuador and the Galápagos Islands. The northernmost populations, particularly those from inland, are migratory, wintering from the extreme south of the United States to southern Mexico, rarely as far south as Costa Rica; on the Baja California peninsula it is only found regularly in winter. It is often treated as a subspecies of the Common or Black-winged Stilt, using the trinomial name Himantopus himantopus mexicanus. However, the AOU has always considered it aspecies in its own right, and the scientific name Himantopus mexicanus is often seen. Matters are more complicated though; sometimes all five distinct lineages of the Common Stilt are treated as different species. But the White-necked Stilt from southern South America (H. h. melanurus when only one species is recognized), parapatric and intergrading to some extent with its northern relative where their ranges meet, would warrant inclusion with the Black-necked stilt when this is separated specifically, becoming Himantopus mexicanus melanurus. Similarly, theHawaiian Stilt, H. m. knudseni, is likely to belong to the American species when this is considered separate; while some treat it as another distinct species, the AOU, BirdLife International and the IUCN do not. Thus, in their scheme the Black-necked Stilt is properly named Himantopus mexicanus mexicanus. Adults have long pink legs and a long thin black bill. They are white below and have black wings and backs. The tail is white with some grey banding. A continuous area of black extends from the back along the hindneck to the head. There, it forms a cap covering the entire head from the top to just below eye-level, with the exception of the areas surrounding the bill and a small white spot above the eye. Males have a greenish gloss to the back and wings, particularly in the breeding season. This is less pronounced or absent in females, which have a brown tinge to these areas instead. Otherwise, the sexes look alike. Downy young are light olive brown with lengthwise rows of black speckles (larger on the back) on the upperparts – essentially where adults are black – and dull white elsewhere, with some dark barring on the flanks. Where their ranges meet in central Brazil, the Black-necked and White-backed stilts intergrade. Such individuals often have some white or grey on top of the head and a white or grey collar separating the black of the hindneck from that of the upper back. The Burrowing Owl (Athene cunicularia) is a small, long-legged owl found throughout open landscapes of North and South America. Burrowing Owls can be found in grasslands, rangelands, agricultural areas, deserts, or any other open dry area with low vegetation. They nest and roost in burrows, such as those excavated by prairie dogs (Cynomys spp.). Unlike most owls, Burrowing Owls are often active during the day, although they tend to avoid the midday heat. But like many other kinds of owls, Burrowing Owls do most of their hunting from dusk until dawn, when they can use their night vision and hearing to their advantage. Living in open grasslands as opposed to the forest, the Burrowing Owl has developed longer legs, which enables it to sprint as well as fly when hunting. Burrowing Owls have bright eyes; their beaks can be dark yellow or gray depending on the subspecies. They lack ear tufts and have a flattened facial disc. The owls have prominent whiteeyebrows and a white “chin” patch which they expand and display during certain behaviors, such as a bobbing of the head when agitated. Adults have brown heads and wings with white spotting. The chest and abdomen are white with variable brown spotting or barring, also depending on the subspecies. Juvenile owls are similar in appearance, but they lack most of the white spotting above and brown barring below. The juveniles have a buff bar across the upper wing and their breast may be buff-colored rather than white. Burrowing Owls of all ages have grayish legs longer than other owls. Males and females are similar in size and appearance, and display little sexual dimorphism. Females tend to be heavier, but males tend to have longer linear measurements (wing length, tail length, etc.). Adult males appear lighter in color than females because they spend more time outside the burrow during daylight, and their feathers become “sun-bleached”. The burrowing owl measures 19–28 cm (7.5–11.0 in) long, spans 50.8–61 cm (20.0–24.0 in) across the wings and weighs 140–240 g (4.9–8.5 oz). As a size comparison, an average adult is slightly larger than an American Robin (Turdus migratorius). The Burrowing Owl is sometimes classified in the monotypic genus Speotyto. This is based on an overall different morphology and karyotype. On the other hand, osteology and DNA sequencedata suggests that the Burrowing Owl is just a terrestrial version of the Athene little owls, and it is today placed in that genus by most authorities. 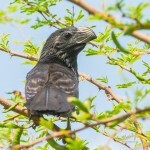 The Groove-billed Ani (Crotophaga sulcirostris) is an odd-looking tropical bird in the cuckoo family with a long tail and a large, curved beak. It is a resident species throughout most of its range, from southern Texas, central Mexico andThe Bahamas, through Central America, to northern Colombia and Venezuela, and coastal Ecuador and Peru. It only retreats from the northern limits of its range in Texas and northern Mexico during winter. The Groove-billed Ani is about 34 cm (13 in) long, and weighs 70–90 g (2.5–3.2 oz). It is completely black, with a very long tail almost as long as its body. It has a huge bill with horizontal grooves along the length of the upper mandible. It is very similar to the Smooth-billed Ani, some of which have bills as small as the Groove-billed and with grooves on the basal half. The two species are best distinguished by voice and range. In flight, the ani alternates between quick, choppy flaps and short glides. Like other anis, the Groove-billed is found in open and partly open country, such as pastures, savanna, and orchards. It feeds largely on a mixed diet of insects, seeds, and fruits. The Groove-billed Ani is protected under the Migratory Bird Treaty Act of 1918.